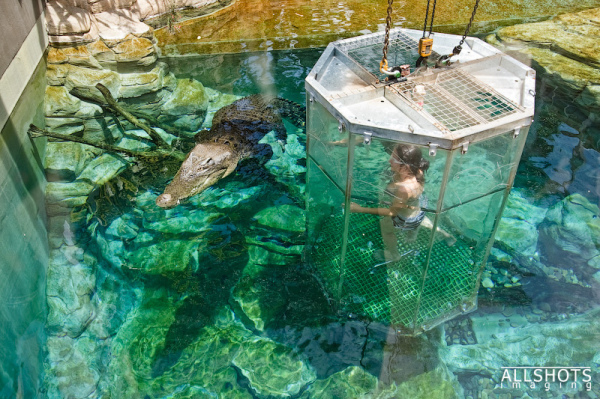 The cage of death is available to experience inside Crocosaurus Cove, a wildlife park in Darwin, Australia. The park offers the only experience of this nature found in the world, using a reinforced perspex cage to plunge guests into a crocodile inhabited tank. These guests spend 15 minutes in the tank with dive equipment, as the (often 5m long) crocodiles are fed and encouraged to swim around it menacingly. Although similar cages are used to view sharks in the wild, this is the only crocodile viewing experience of this kind.